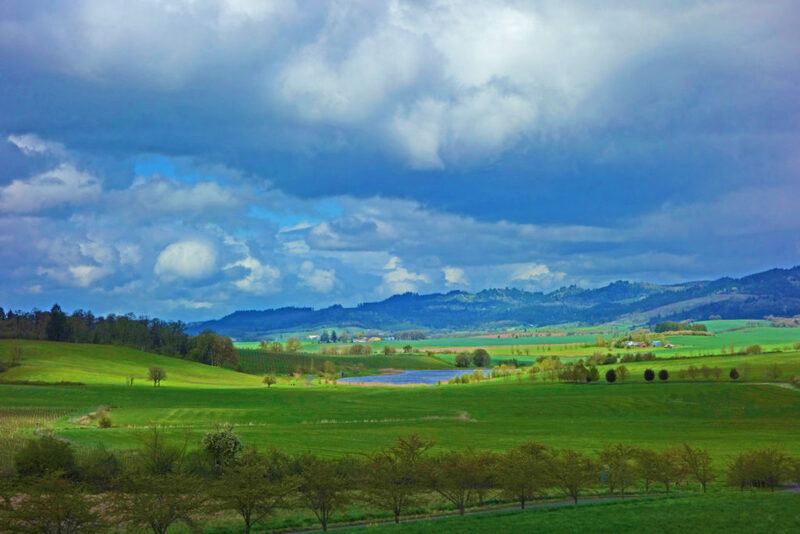 Both resident and visiting wine drinkers in Oregon’s Willamette Valley are confronted with a Gordian knot-like problem: With over 500 wineries, how can you possibly figure out which to visit and which to skip? But there’s a simple solution: Rather than spending hours visiting Websites or consulting guidebooks to decide where to go, just pick a few and go taste wine! Here are five wineries, plus a couple of places to taste beer and eat good food, that I discovered during a three-day, two-night long weekend in mid-valley back in April of this year. The Willamette River, and Interstate 5, both which run north from Eugene to Portland, are the lines that divided my wine, beer and food stops into a more or less equal number of “West Side” and “East Side” locations, with the state’s capitol city, Salem, about smack-dab in the middle. While you could stay overnight anywhere in the Salem area in order to cover the ground I did during my wine-beer-food excursion, the Oregon Garden Resort, just outside of the town of Silverton, east of Salem, proved to be a good launching pad for my culinary adventures. In the 1940s, the Oregon Association of Nurseries thought that creating a botanical garden near Silverton would be a great way to show Oregonians the flora that they could plant around their homes. But a half century would elapse before the need of the City of Silverton to find a site for a wetland system to recycle treated wastewater before returning it into area streams coincided with newly formed Oregon Nurseymen’s Garden Foundation desire to bring the dormant “demo garden” to fruition finally resulted in groundbreaking for the Oregon Garden in 1997. Oregon Garden visitors pay an admission fee; those staying at the Oregon Garden Resort have free entrance during their stay. You can walk through the Garden, but before doing so, I recommend taking the 25-minute tram tour (included with your garden admission fee and free to resort guests) which provides an excellent overview of the entire garden complex. The Oregon Garden Resort has a variety of accommodations. Complimentary breakfast is offered to guests. There is a bar and a restaurant open from lunch and dinner. For a top-notch dining experience, I recommend the Silver Grille in Silverton, just a five-minute drive from the resort. If you want a starter for yourself, try “The Naughty Librarian” salad. When you say “Tri-tip” I normally think of a cheap cut of beef that has to be either cooked for hours in a smoker or drenched with ketchup-flavored sauce. 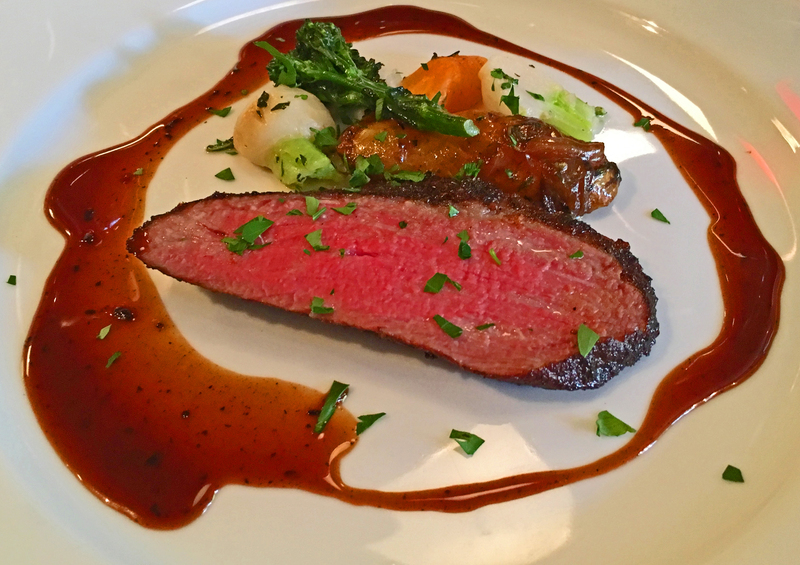 But the “Slow-roasted Cedar River Farms Tri Tip” on the Silver Grille’s menu was like nothing I’ve had anywhere and more like USDA Prime filet mignon. Whatever you order as a starter or entrée, be sure to save room for the “to-die-for” desserts. If the evening is still young, when your return to the Oregon Garden Resort, stop by the bar for an after-dinner libation and to listen to live music. 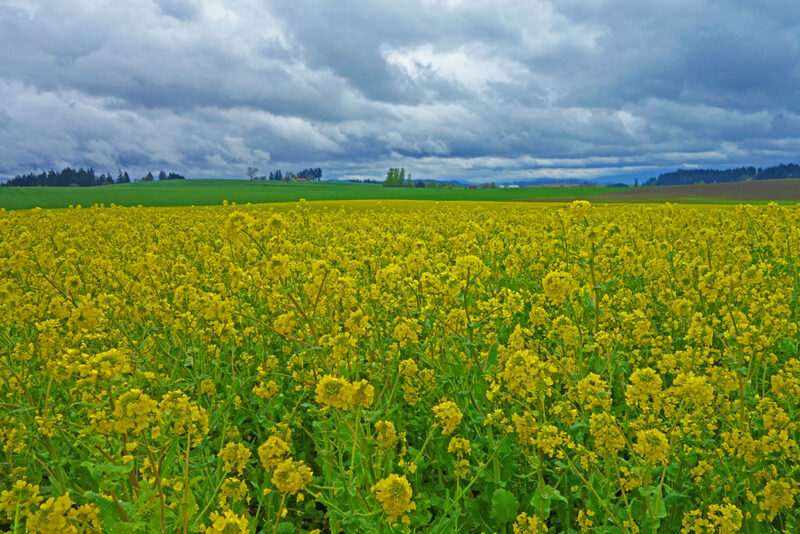 After breakfast at the Oregon Garden Resort, it’s time to head west on the wine trail, passing through fields of varying crops and flower plants in this prime agricultural landscape. My top pick for across-the-board good to drink, moderately priced, wines were the ones I tasted at Eola Hills Wine Cellars, an example of “American-Industrial Park” architecture right off busy Highway 99 in Rickreall, about 11 miles due-west of Salem and a 40-minute drive west from the Oregon Garden Resort. While the exterior of the building isn’t exactly “eye candy,” the interior will invite you to linger while you taste wine. 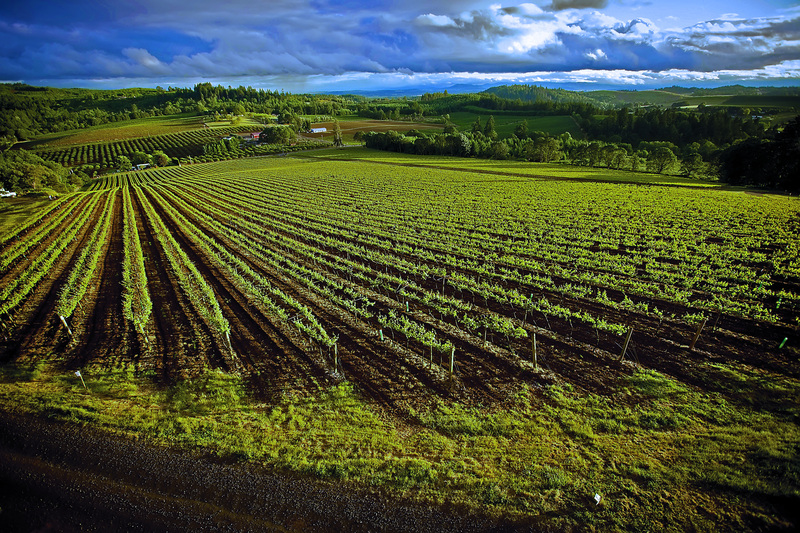 Founder and CEO, Tom Huggins, began planting vineyards back in 1982 when the Oregon wine industry was in its modern-day infancy. When I met him in April, he was about to head off to Europe to lead a group tour through wine growing regions of Croatia and Northern Italy, the 2017 edition of the type of international trip that the winery organizes each year. number three, along with Cabernet Sauvignon, Merlot, Zinfandel, Sangiovese, Petite Sirah, Sauvignon Blanc, Gewurztraminer, White Riesling are used to make up the rest of winery’s offerings. Before visiting Eola Hills main tasting room, the group of travel writers I spent the weekend with stopped off at the winery’s Legacy Estate vineyard property which slopes eastward up from Oak Grove Road. A temporary tasting room was about to open when I was there back in April; a more permanent building, plus an inn and spa, are planned for the future. But right now, the area around a lake above the tasting room is available for events and weddings. Just nine miles and about five minutes north on Highway 99 from the Eola Hills tasting room you’ll find the Left Coast Cellars tasting room and café, at a quiet spot in a small valley just above the highway. 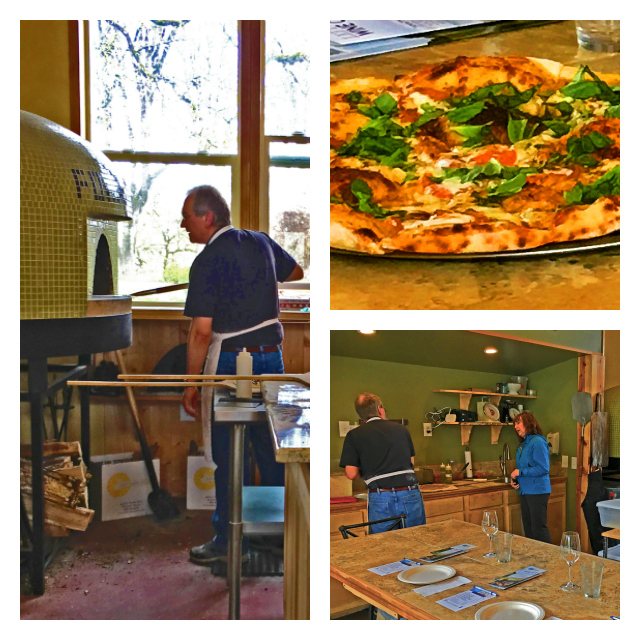 While I’m sure you’ll find those choices tempting, you must, must plan your visit for a weekend when some of the best pizza you’ll ever eat is prepared in the café’s wood-fired pizza oven. 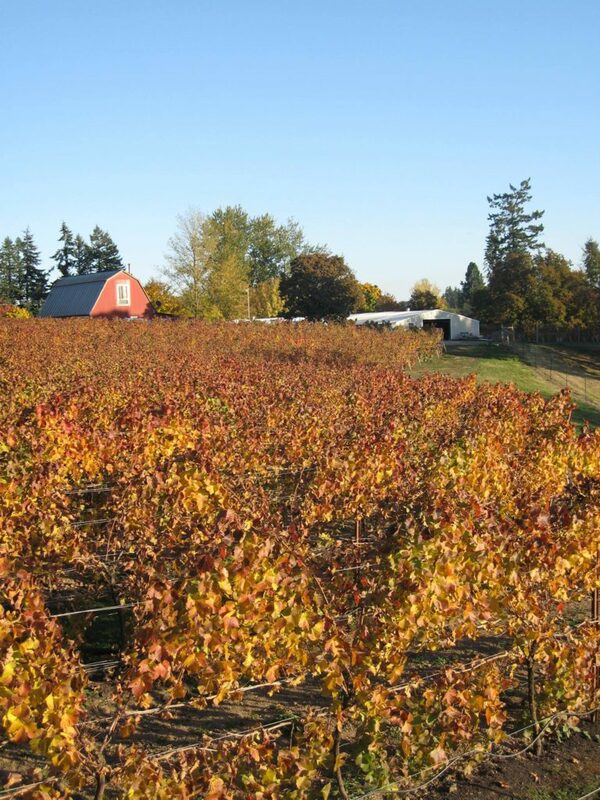 As you’d expect from any Oregon winery, Left Coast Cellars makes its wines from Pinot Noir and Pinot Gris grapes. But there is also Chardonnay, Viognier, Syrah, and a sparkling wine that has a “secret ingredient”—honey from hives the winery maintains and which can itself be purchased at the tasting room. Left Coast Cellars prides itself on its “Sustainability and Community” approach to running its business. 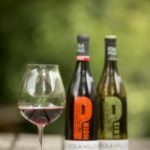 Most of the energy it uses comes from on-site solar panels, and it is one of 14 wineries to complete the Oregon Environmental Council’s Carbon Reduction Challenge, and one of 6 to undergo “an independent audit to achieve a goal of complete carbon neutrality.” And it is working with the U.S. Fish & Wildlife Service to restore the old growth oak forest on its property, and with “Salmon-Safe” on watershed and fishery protection. I’ll Drink (Beer) to That! 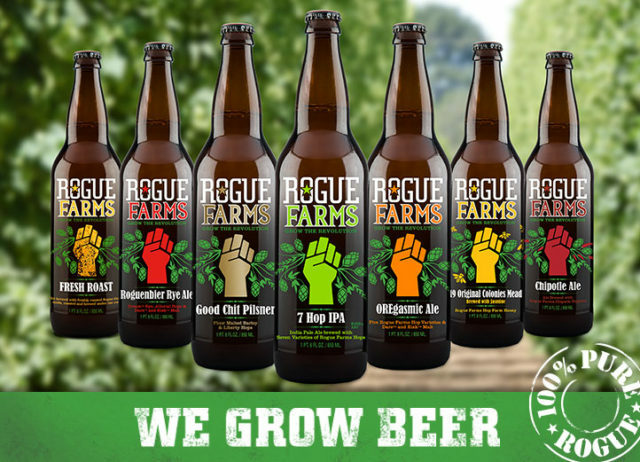 And Rogue Farms not only “grows” it’s fair share of the “Beer Food Group,” it also produces other beverages include whiskey, gin, vodka, and rum, cider, and sodas. 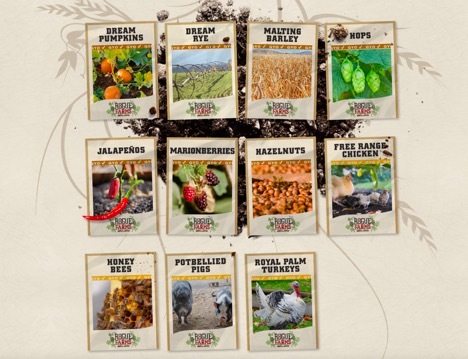 It also raises ingredients that go into those beverages, such as hops, barley, and rye, pumpkins, marionberries, hazelnuts and jalapeno peppers. Plus, you may see honeybees, free-range chickens, turkeys, and potbellied pigs during your farm visit. While you can taste the farm’s liquid output, to get the most out of your visit, call or e-mail ahead and ask to be taken on a tour of the property. It’s a great way to learn how hops, vine-like plants that climb up “strings” tied onto a high trellis, grow and then are harvested. To get from Rogue Farms to Willamette Valley Vineyards—my recommended dinner stop—you could simply head back the way you came, and then drive east. 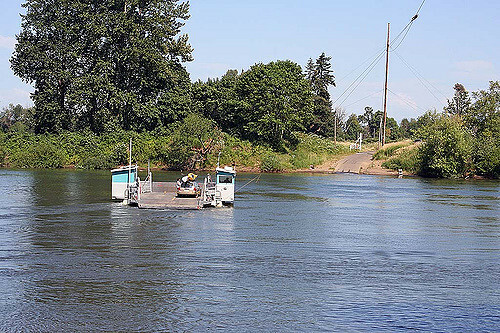 But for a more interesting and “scenic,” albeit brief respite from being a road warrior, follow this route south along the west side of the Willamette River and then pay $3/car to cross over it on the Buena Vista Ferry. Once you’re on the other side of the river, head east to I-5 then up the freeway to the winery. 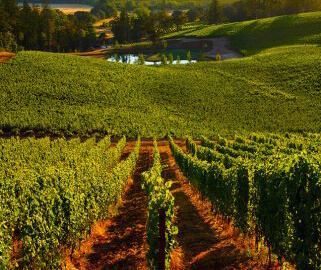 Willamette Valley Vineyards is just off I-5 south of Salem. Take the Enchanted Way exit off the highway, turn right on the frontage road, and drive past the Enchanted Forest “not-quite-your-Disneyland” theme park. The park’s founder, Roger Tofte, built the place because he “realized there was very little for a family to see and do together in Salem” back in the 1960’s. The history of Enchanted Forest is worth a read, but you’ll have to come back to visit another time with “under- the-age-of-drinking” kids because you’re been putting the pedal to the metal to get to the winery while the tasting room is open and before dinner at 7:00 p.m.
Like Eola Hills, Willamette Valley Vineyards is one of the state’s oldest wineries. It was established over thirty years ago when founder, Jim Berneau, planted Pinot Noir, Chardonnay, and Pinot Gris grapes where a plum orchard had once been. The joke among winery owners is that to make a small fortune in the business simply start out with a large one and watch your money slowly disappear. But Berneau had a better idea: Why not have the fans of his wines become part-owners in the business through share purchases? 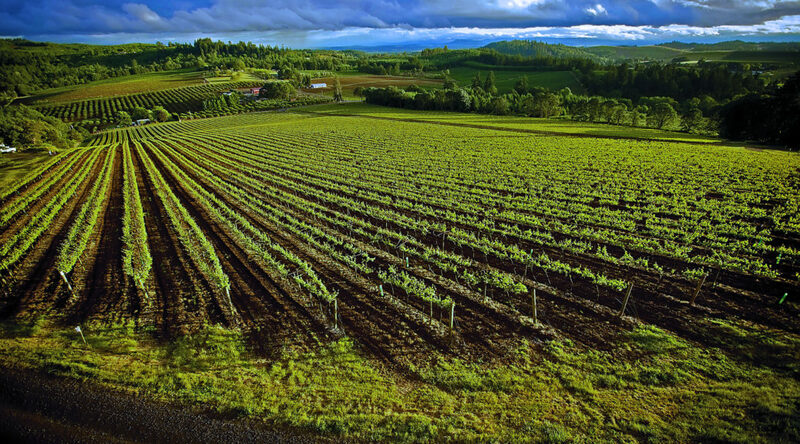 Today, 9,000 people have a stake in Willamette Valley Vineyards and, if you want to be able to brag to your friends that you, too “own” a winery, just read the prospectus and buy some stock. The tasting room is open daily, and there is a free 20 to 30minute public tour at 2:00 p.m. Reservations can be made in advance of your visit for longer one-hour to hour-and-a-half private tours, which include tastings and cheese pairings at a cost of $20/person. 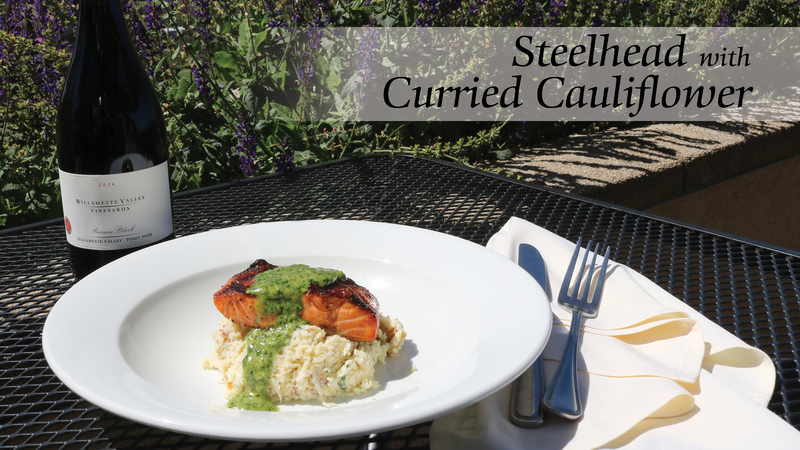 Intriguing dishes, including appetizers, small plates, entrees and desserts, are served from 11 am to 6 pm, making the winery an excellent lunch stop. And if you are taking those “underage” kids to Enchanted Forest, the winery offers a limited kid’s menu, too. 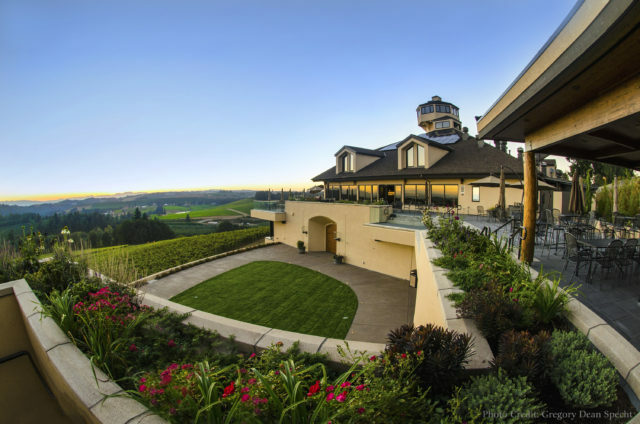 But the reason that I’m recommending that you visit Willamette Valley Vineyards at the end of a day’s romp around the middle of the Willamette Valley is not just to taste wines, but to taste them paired with a four-course “foodie delight” dinner. 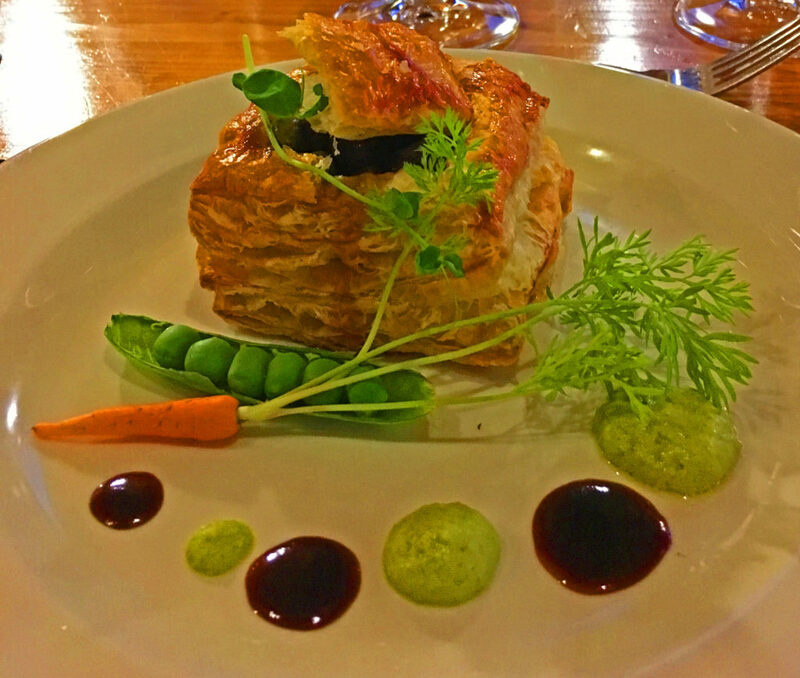 The “Pairing Wine Dinner” is offered year-round, but only on Friday and Saturday evenings at 7:00 p.m., after the tasting room closes to the public. At first blush, the $65/person cost might seem steep, but back in Northern California’s “Wine Country,” I often paid half again or twice as much for a comparable wine and food feast. Before dinner, spend some time sipping a glass of wine out on the deck overlooking the valley. Then sit back, and enjoy the meal as the chef and one of the winery staff provide the details on the wine and victuals that that will be creating fond memories on your palate. While I came with a group, the winery will “pair” you up at a table with other guests if you are on are coming “solo” or with just one other guest. Be sure to call ahead to reserve your spot at this gourmet feast, or make reservations online under the “Events” section of the winery’s Website. 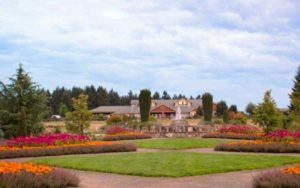 If you’re staying at Oregon Garden Resort, pack up your bags and check out of the resort before leaving for a morning of wine tasting and a “beer-infused” lunch at the end of your weekend. 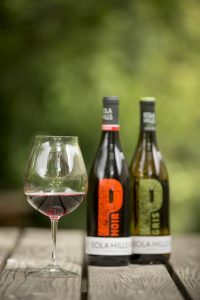 While at larger wineries in this part of Oregon, such as Eola Hills and Willamette Valley Vineyards, you’ll find many staff on hand to help you enjoy your visit, at the “Mom & Pop” operations the person greeting you and pouring your wine is likely to be the winemaker. That was the case when I arrived at Piluso Vineyard & Winery on day two of my mid-Valley wine “foraging” trip. 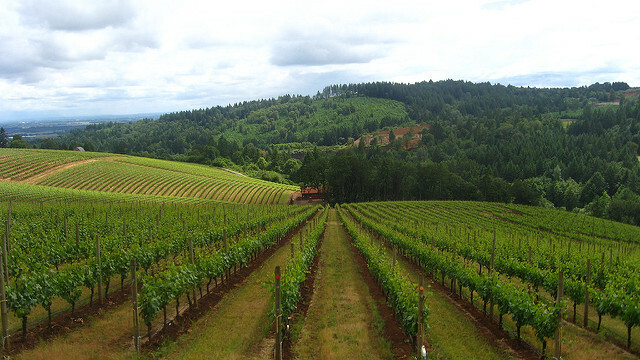 The winery and vineyards are about a twenty-minute drive south from Oregon Garden Resort. Owner and winemaker, Sandee Piluso, grew up on a ranch in California’s San Joaquin Valley. But after playing “hide and seek” late one night in the vineyards at a friend’s home, she made up her mind that when she grew up she would make wine rather than raise cows as her parents had done. 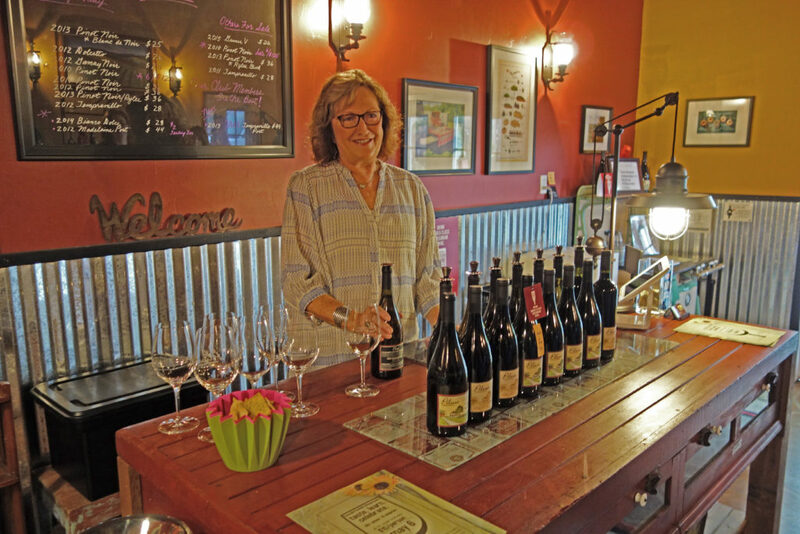 Nearly twenty years ago, she and her husband bought a 67-acre farm, planted 4 acres in grapes, and in 2013 produced their first Pinot Noir. Today, you’ll find Sandee in the tasting room pouring not just Pinot Noir, but also Dolcetto, Tempranillo, Gruner Veltliner, Gamay Noir and Gamay Noir Blanc, plus two dessert wines, one made from Chardonnay grapes in the German “eiswein” style, and the other a port. Next, head about nine miles north to Pudding River Wine Cellars. Since wine from Pudding River had been served with our meal at Silver Grille on Friday evening, I was eager to visit the winery. Winemaker Sean Driggers and his wife decided that working hammer and tongs in the high-tech industry wasn’t how they wanted to spend the entirety of their working days, so they decided that mixing wine-making with tech work wouldn’t be a bad occupational compromise. Ten years into that life-style change, today the winery produces Malbec, Syrah, Pinot Noir, Chardonnay, Viognier, Pinot Gris and Riesling. You’ll wrap up the day by driving fifteen minutes back into Silverton for lunch at the Seven Brides Brewing. I had wrongly assumed that the brewery’s name came from the 1954 musical film, Seven Brides for Seven Brothers. In that flick set in the mid-nineteenth-century Oregon, a woman who discovers that she has to keep house not only for her new husband, but also his six brothers, hatches a scheme to find brides for each of her brothers-in-law. But the only link between the movie and Seven Brides Brewing is that Oregon is the location for both, and eventually seven brides will be wed. 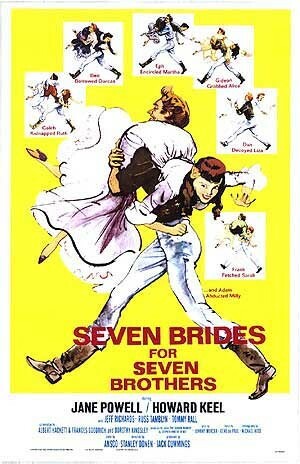 In the twenty-first century “Seven Brides” story, the brewery’s three owners will have to sell enough beer to pay for the weddings of their seven daughters, each of whom has a beer named after her. While Seven Brides Brewing serves breakfast on weekends, you’ll be ordering lunch from the dinner menu. Come with a big appetite because the portions are huge. 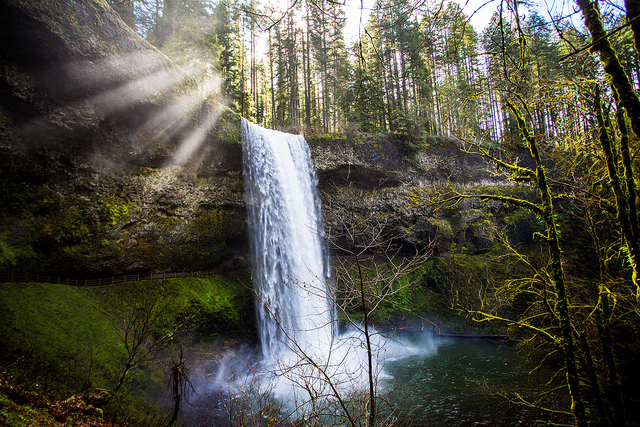 If you feel the need to “work off” the calories you’ve ingested over past two days, drive a half hour southeast of the brewery to Silver Falls State Park and take a long or short hike along the waterfalls trails. If hiking’s not your “thing,” just spend some time walking around the historic town of Silverton before heading home.